Robotic systems using elastic actuators provide safe human-robot interaction and energy-efficient operation. 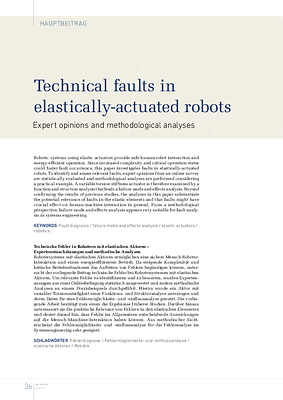 Since increased complexity and critical operation states could foster fault occurrence, this paper investigates faults in elastically-actuated robots. To identify and assess relevant faults, expert opinions from an online survey are statistically evaluated and methodological analyses are performed considering a practical example. A variable torsion stiffness actuator is therefore examined by a function and structure analysis that feeds a failure mode and effects analysis. Beyond conﬁrming the results of previous studies, the analyses in this paper substantiate the potential relevance of faults in the elastic elements and that faults might have crucial effect on human-machine interaction in general. From a methodological perspective, failure mode and effects analysis appears very suitable for fault analysis in systems engineering.